Okay, one last post about Thought Bubble, I promise. This one's a bit special. 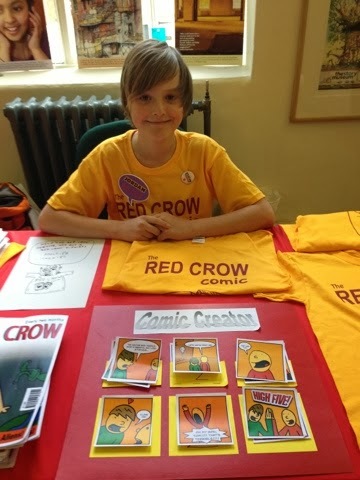 Jordan Vigay (12) and his brilliant comic The Red Crow! 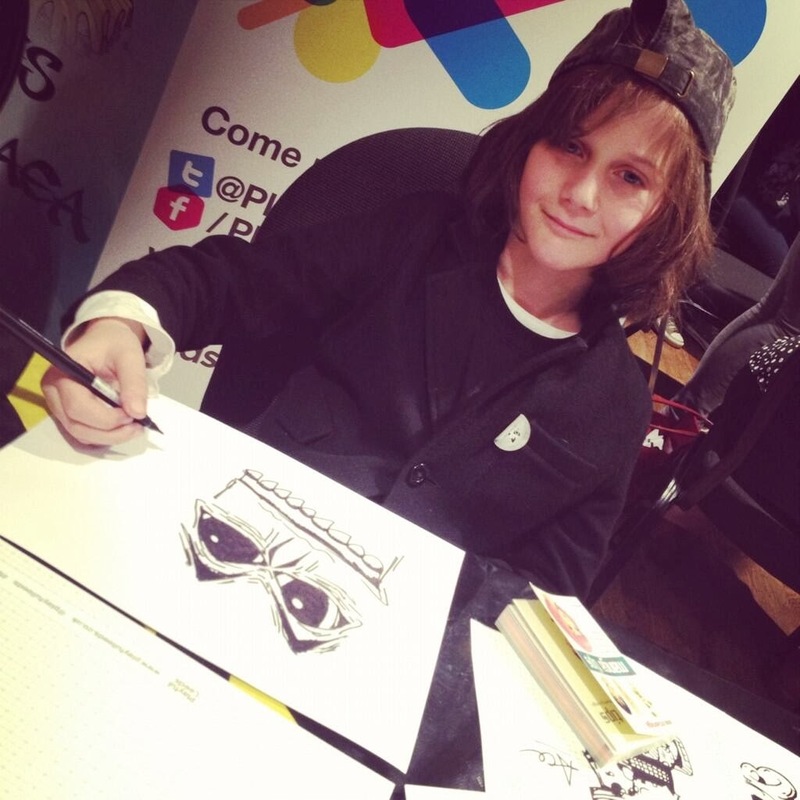 Did you know Jordan has HIS OWN PAGE in Issue 100 of the Phoenix? Which is out today? Because he does! Anyway. It was a lot of fun to hang out with both Jordan and Ace as they are both very smart, funny, and incredibly talented kids. At one point I got back to the table from wandering around the convention and Jordan came over, seeming slightly confused, and said to me, "a kid just came up to my table and said he'd heard about The Red Crow already, that someone went to their school and told them about it last week." Yep, that was probably me. 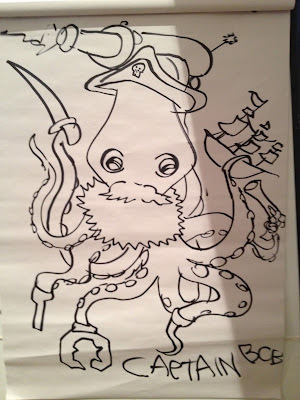 I've been doing a lot of workshops in schools lately, and an increasing number of talks to grown-ups, too; to other writers, to teachers and librarians and parents. 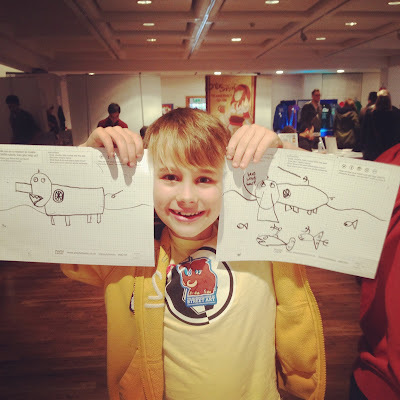 I talk about how I think one of the most powerful things about comics for children is how much they encourage engagement and participation; about how unlike other media like video games and animation and even prose books, even the youngest kids are able to finish reading a comic and IMMEDIATELY have a go at making their own. About how brilliant it is that this doesn't require any special training or equipment or even, necessarily, the ability to read or write yet. 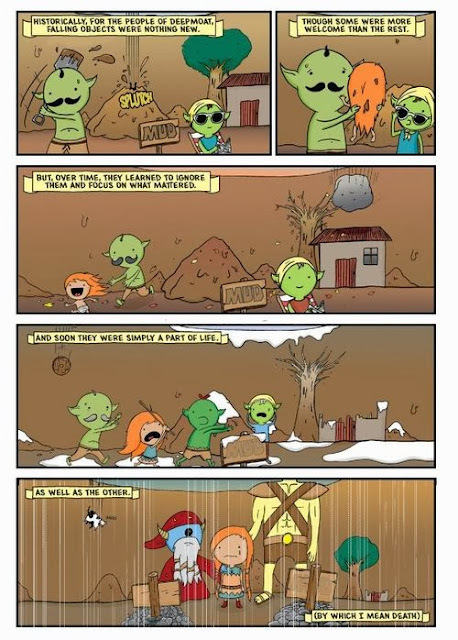 How anyone, from even the youngest age, can start making their own comics, and all the benefits this confers in terms of literacy, creativity and sheer fun. So that's one of the things I talk about when I visit schools. 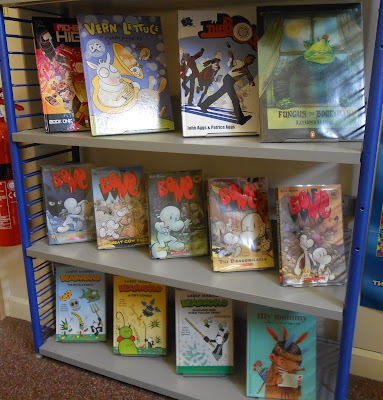 And to further make the point, these days I often show kids some examples of comics made by children, to show some of the amazing things being made by people their own age or slightly older. 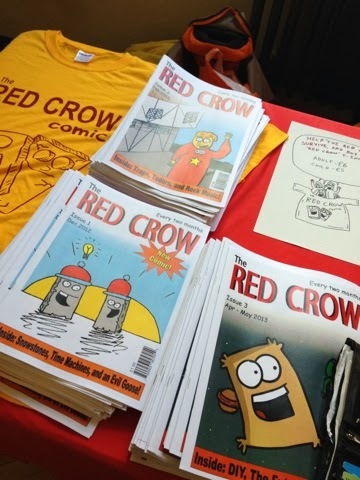 I talk about Jordan's comic, The Red Crow. 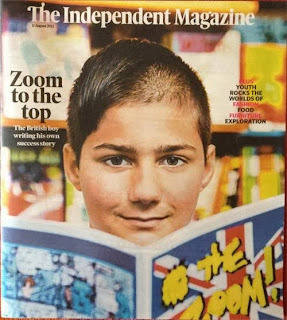 I talk about the phenomenon that is Zoom Rockman and his comic The Zoom, and about this kid Lewis I met at a festival once who, at the age of 12, has already created OVER 150 ISSUES OF HIS OWN WEEKLY COMIC. I try to get across this incredibly exciting thing about comics; that you don't need to wait for permission or to be a grown-up before you can dive in and start creating your own stuff. That you can just GO. 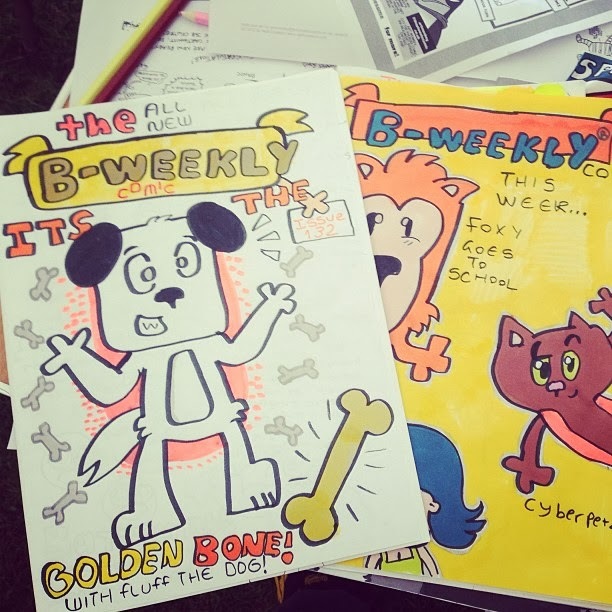 The B-Weekly, by Lewis. (Wilkinson? I think? Sorry if I got that wrong, Lewis!) But the main point is: 150 ISSUES!?! 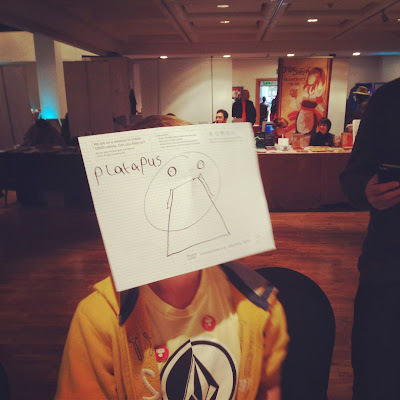 So it was great to see Jordan and Ace diving right in and having their own tables at Thought Bubble. And to see Jack Land again - the very same young man who won our Phoenix design-a-character strip at last year's event, and this year has his very own page in the Thought Bubble anthology! Published by Image Comics! I'VE never been published by Image Comics! Dammit, Jack! 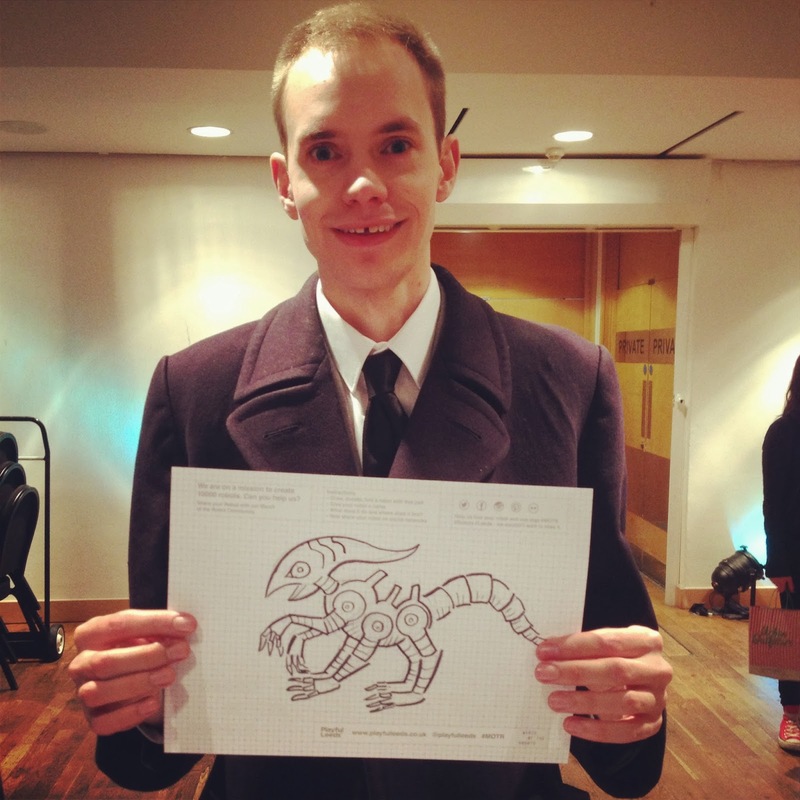 'Darren's Dentist' by Jack Land, in the Thought bubble anthology 2013! 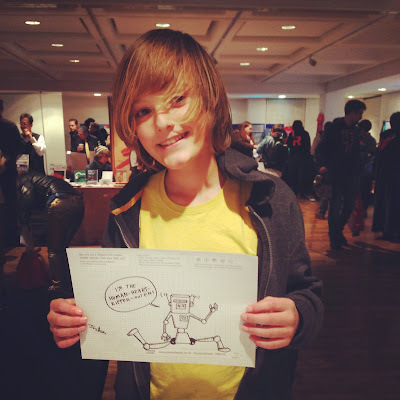 And to see Holly the robot-drawing prodigy again, and the kid whose name I'm terribly sorry to have forgotten who brought over a copy of his own comic 'PUPKINS! 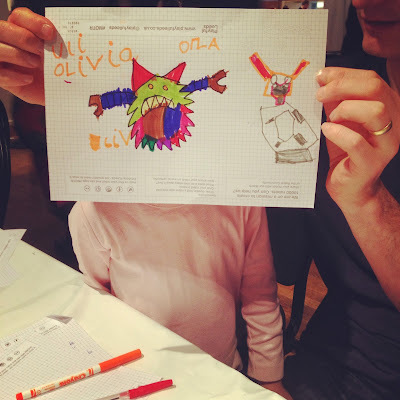 ', and all the other kids who hung out and created characters with Art Heroes UK, or who spun the Phoenix's Wheel of Awesomeness, or who designed Robots with Playful Leeds. Getting to see that level of enthusiasm and engagement is the kind of thing that really does make me remember why comics are so very, very cool, and so important, and makes me incredibly optimistic about their future. 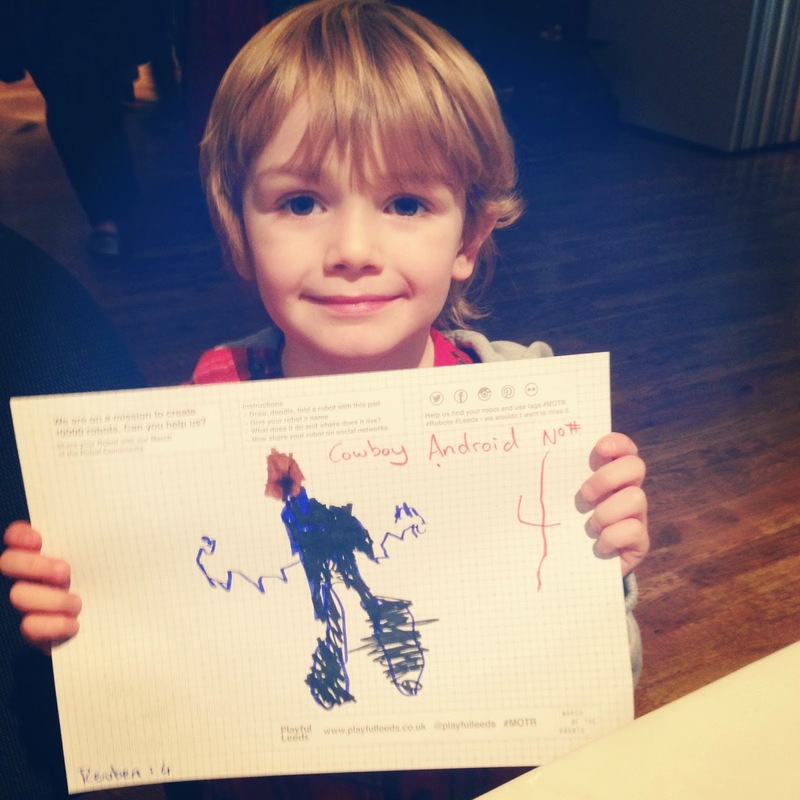 "Put the Bunny in the cargo hold". 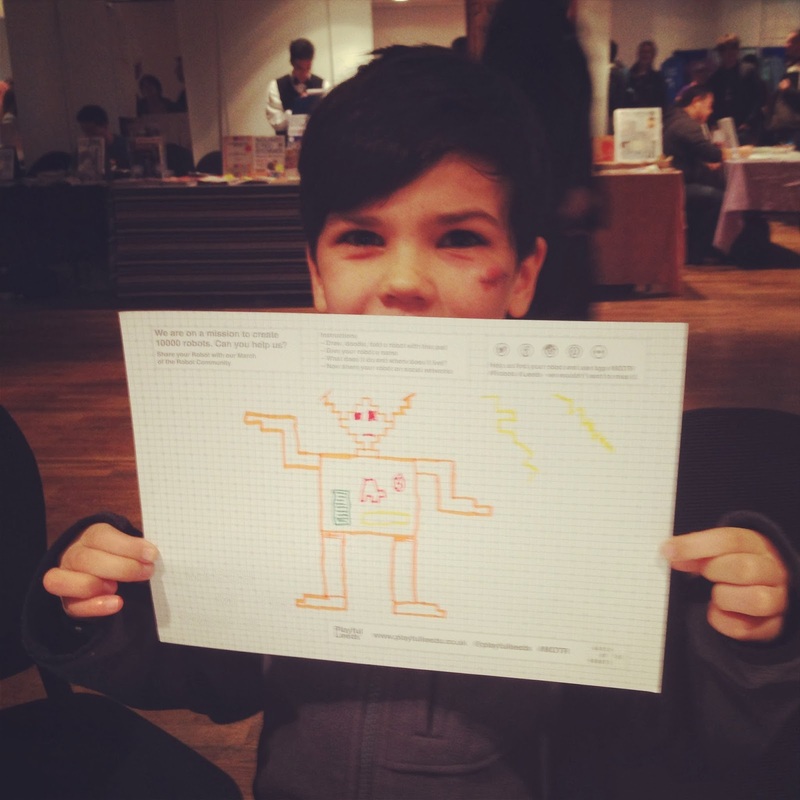 So far in these What Happened At Thought Bubble Recaps we've covered Awesome Robots and Awesome Creators of All-Ages Comics. 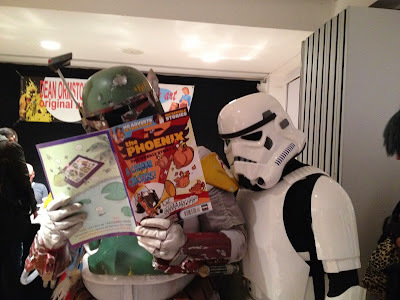 And, speaking of awesome all-ages comics: ANOTHER fun thing I was doing was hanging out with the guys from The Phoenix! 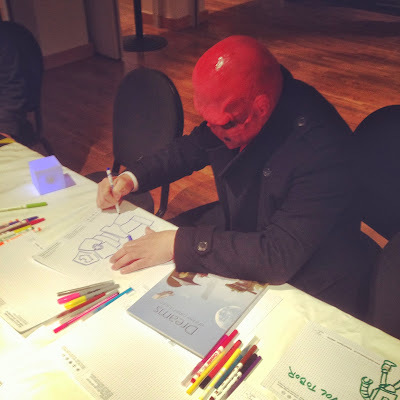 It was a lot of fun, and it felt a bit different from last year - there seemed to be a lot of excitement about the comic amongst readers and other creators already, so we weren't having to always start from that point of "Hey, Have you heard of the Phoenix? Okay, well. Remember how weekly comics for kids used to be a thing...?" 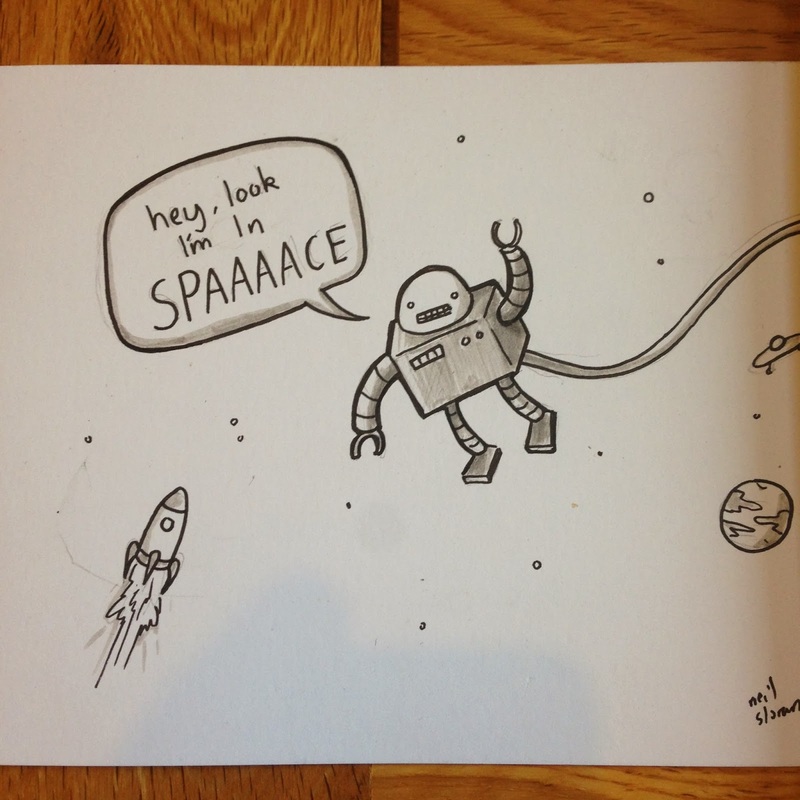 Quite a lot of this sort of thing, essentially. 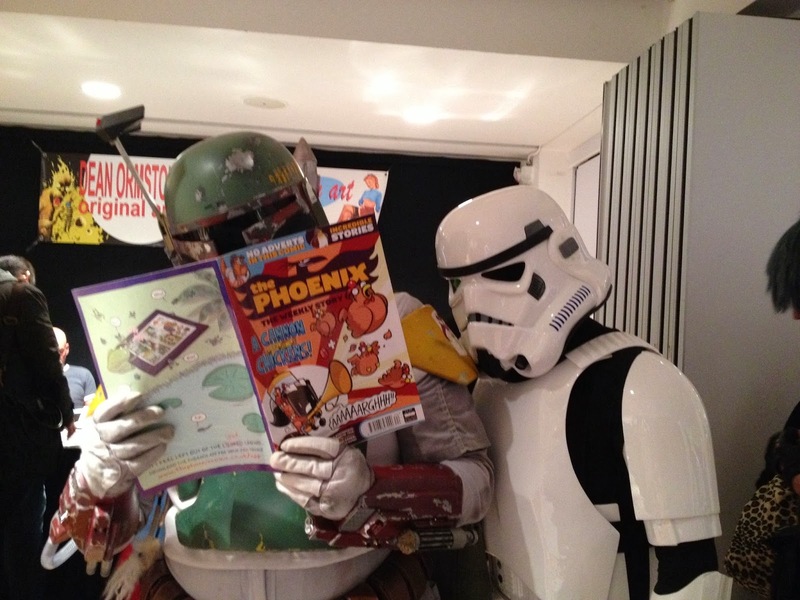 I wanted to say a quick thanks to Team Phoenix for all their hard work and dedication over the weekend, spreading the good word on kids' comics. And so, I allowed myself to be bullied into drawing them all on dinosaurs. 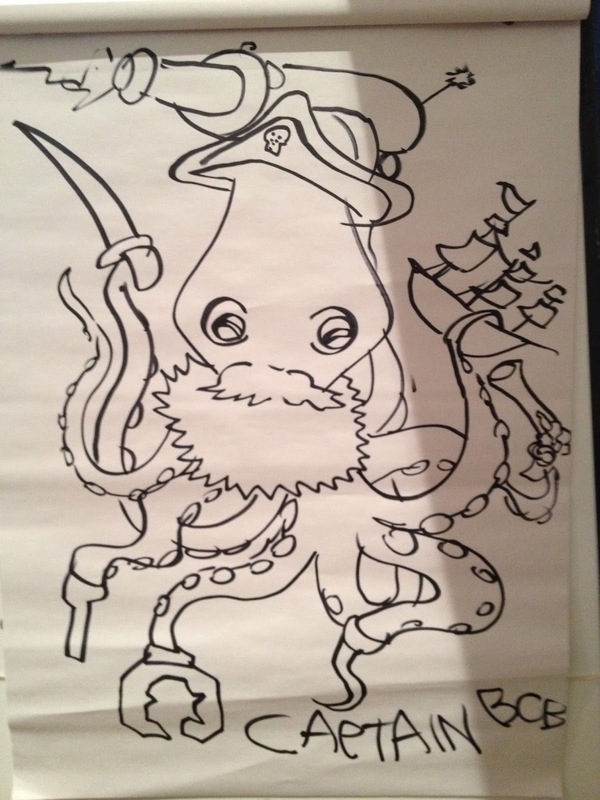 As instances of workplace bullying go, it was pretty fun. I just feel bad because Editor Will was off manning the table in the other hall, and therefore didn't get a dinosaur to ride. Next year, Will. We have already picked out a dinosaur for you. Did you also know you can buy single issues, subscriptions, graphic novels and all kinds of Christmas-present-appropriate Phoenixy goodness HERE? 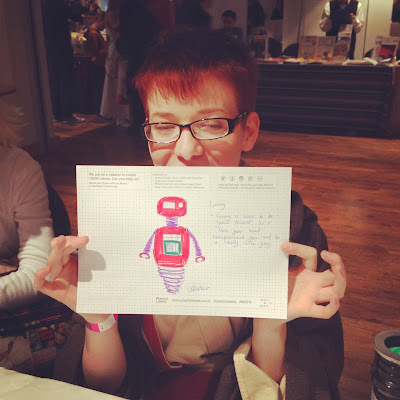 I blogged yesterday about one of the cool things I got to do at Thought Bubble over the weekend, running some workshops where I got to hang out and draw awesome robots with various delightful festivalgoers of all ages and self-professed abilities. Nathan Fox - an amazing artist whose work was new to me and I'm delighted to have discovered. I picked up his amazing-looking book from Scholastic, Dogs of War, which tells several stories of dogs during wartime and - yeah, I haven't had a chance to read it in full yet, but already I have a horrible feeling it's going to cause me to experience EMOTIONS. Nathan's art is frankly phenomenal: incredibly characterful and dynamic, with really vigorous, powerful inks and just brilliant panel-to-panel comics storytelling. Maris Wicks - another discovery for me, I grabbed her book Primates: The Fearless Science of Jane Goodall, dian Fossey and Biruté Galdikas, because it is just exactly the sort of comic I wish we saw more of over here. 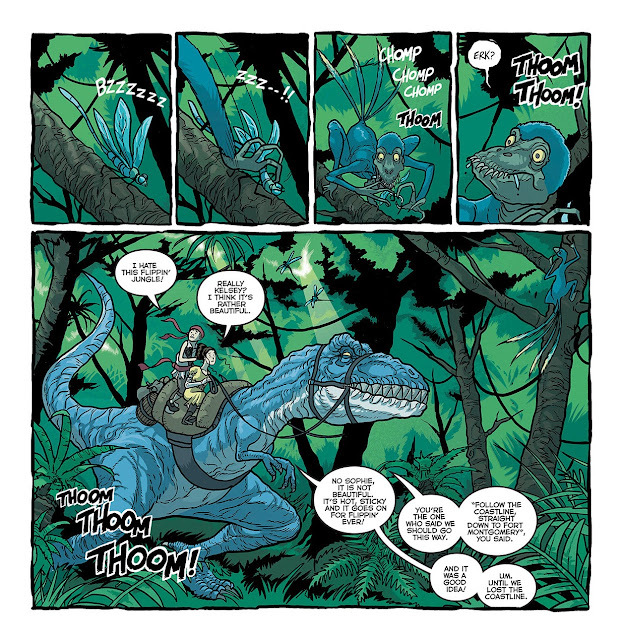 A funny, charming, educational all-ages graphic novel about primatology. This was a New York Times Bestseller, people! KIDS LIKE COMICS, have I mentioned that yet? And of course, Roger Langridge, who has written and drawn all kinds of amazing things from Fred The Clown to The Muppets to Thor the Mighty Avenger to hey look you probably don't need me to tell you how amazing Roger Langridge is. 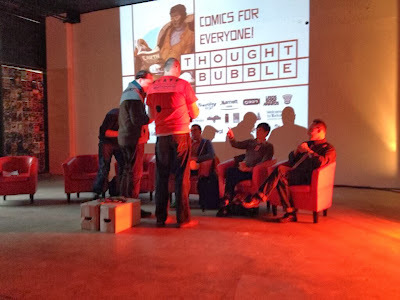 Anyway, I enjoyed the panel hugely and can only hope the audience did half as much. Quite apart from the fact that all three were lovely, it was fascinating to learn how much I think we all had in common in terms both of our own experiences with comics and learning to read, and of our beliefs about how important comics, creativity and play are in kids' lives. It was also really interesting to me to get a chance to hear about the varying forms a lot of these issues take in different parts of the world and different comics cultures. Matt Badham compered the thing excellently and also managed to get in contributions from some more creators in the audience; Dave Bulmer and Abby Ryder, creators of one of the exceptionally brilliant comic Imaginary Gumbo, Daniel Clifford of Art Heroes UK, and Richard Bruton of the Forbidden Planet blog, whose school graphic novel library is rapidly gaining legendary status and is something I always evangelise about whenever I'm talking to teachers and librarians. ANYWAY. 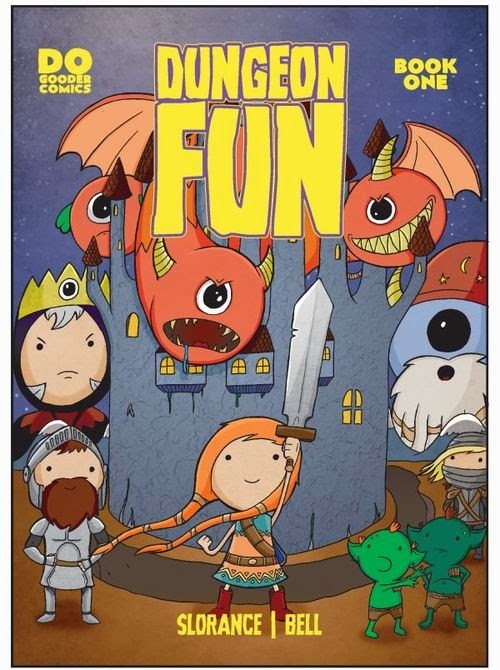 Yeah, it was really fun, and if you're remotely interested in the kind of stuff I usually talk about here, I can't recommend highly enough that you check out Roger, Nathan and Maris' work. 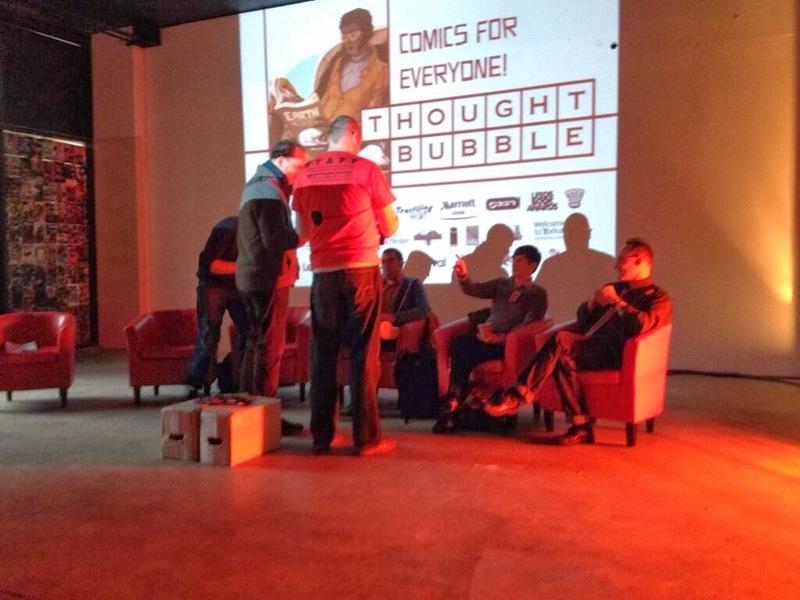 I spent a fantastic weekend just past at Thought Bubble, the Greatest Comics Festival in the World or Certainly Leeds. 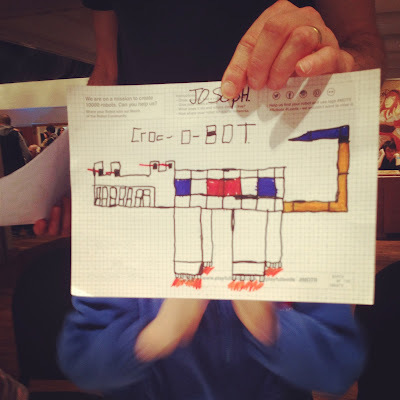 Amongst the numerous fun things I was doing there were running some informal workshops, teaching kids How To Draw Robots (Awesome Variety). I was doing this with Playful Leeds as part of their year-long March of the Robots project, which is a hugely fun and brilliant idea involving doing all kinds of activities and events to eventually fill Leeds with 10,000 ROBOTS, and which you can read all about HERE. So here are some of our Awesome Robot Volunteer Design Team from the weekend! Cool Weird Manga-Style Undead Elf Bot! I think? Anyway, AWESOME, is the main point. 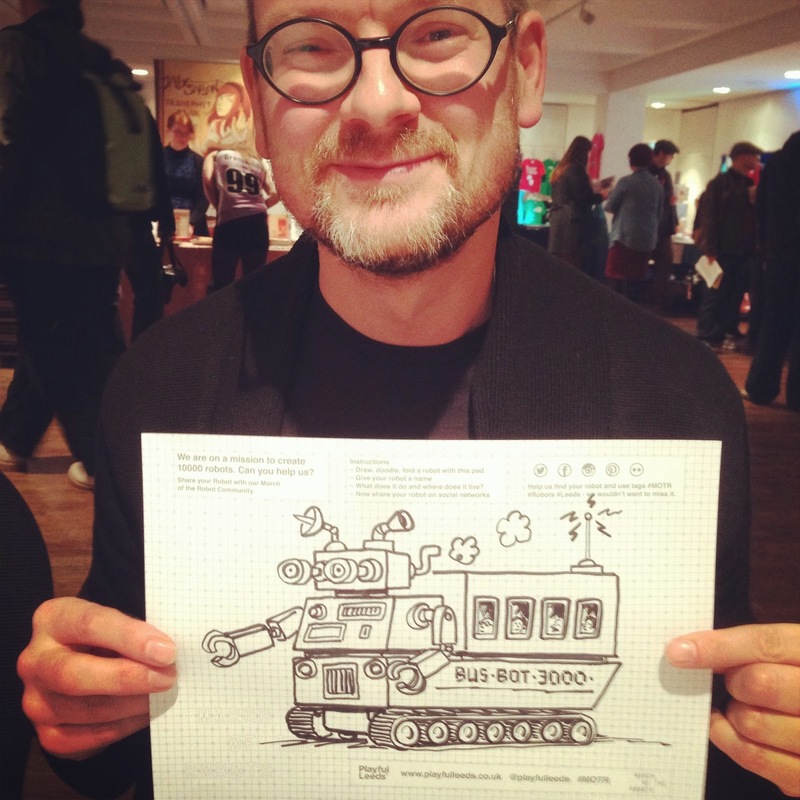 Why, it's award-winning author Dave Shelton and his BUS-BOT 3000! Even Nazi super-criminals love drawing robots! And Pacific Rim, apparently. Why, it's Phoenix comics and design superstar Matt Baxter and his "Wibble-Limbed Wobble-Bot". Lord help us. 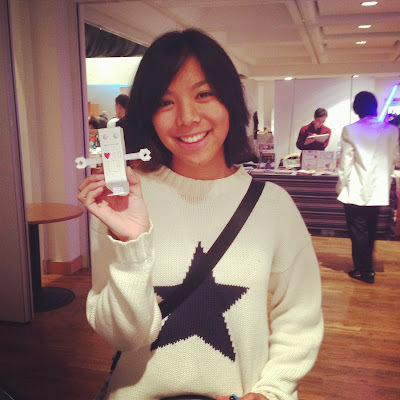 A Robot named Larry. "Larry is here to be your friend, he'll love you and compliment you and be a really nice guy". 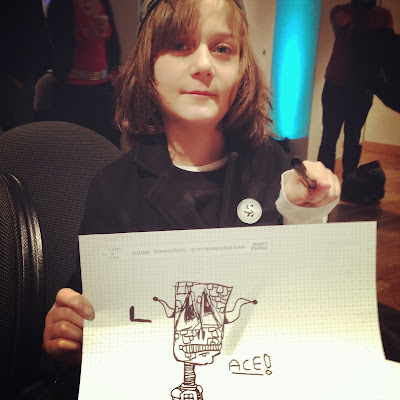 Why, it's award-winning comic creator Zoom Rockman's little brother Ace! Pictured here with the first of approximately ONE BILLION AWESOME ROBOTS he drew over the weekend. A highly colourful Werewolf-Bot and a Mo-Bot! HOORAY! 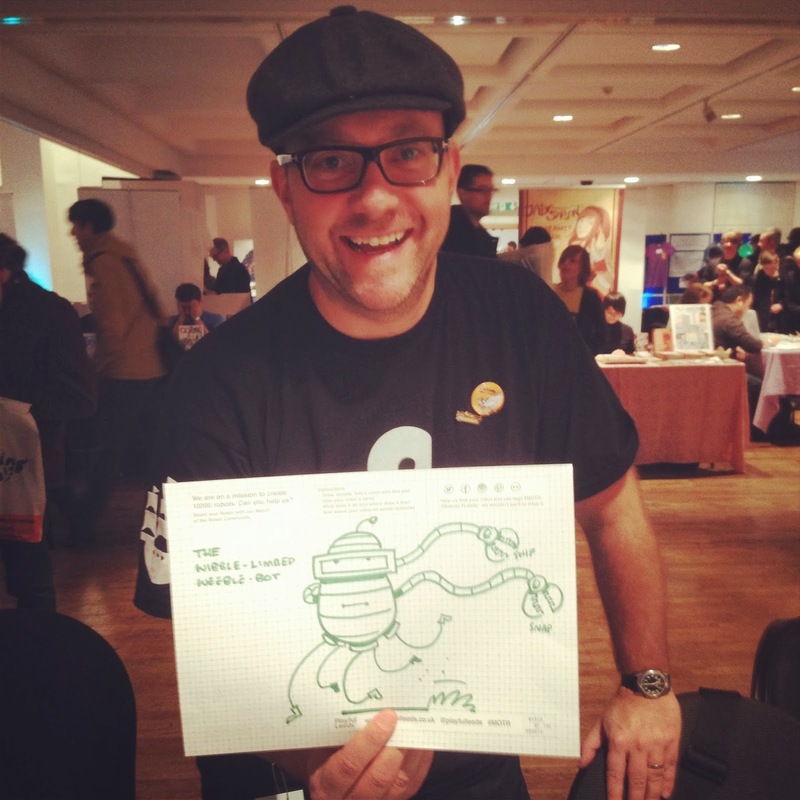 Why, it's the excedingly dapper comic creator Matthew Bramble and his esoteric six-legged sort-of-a-chameleon-I-guess?-bot! Why, it's Phoenix comics superstar of tomorrow (ALMOST LITERALLY, he's got a page in next week's! ), Jordan Vigay! A rather fine Mondrian-inspired robotic crocodile. 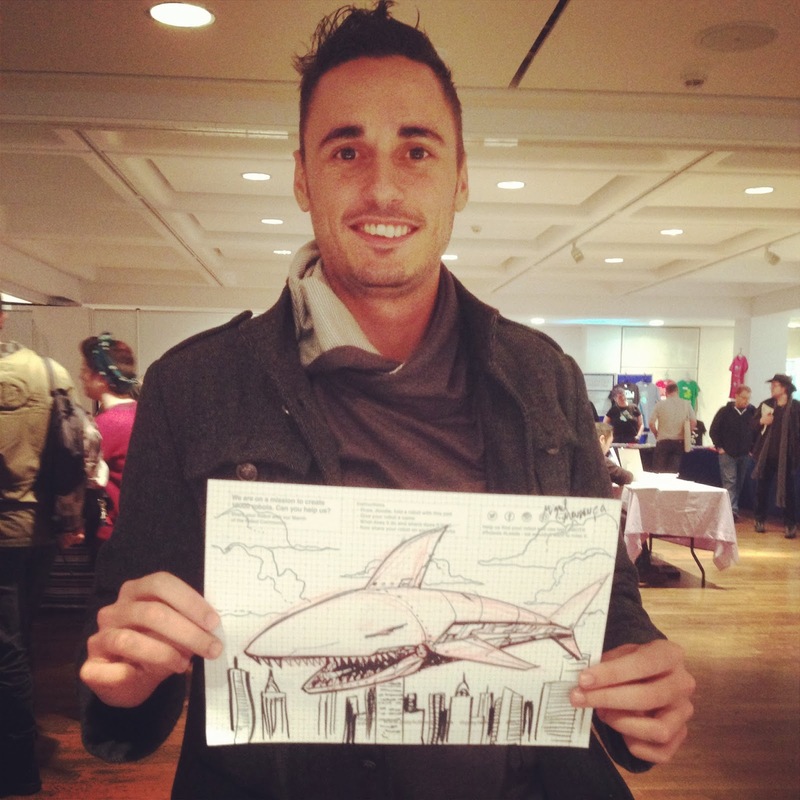 DUDE look at that Shark-Bot. 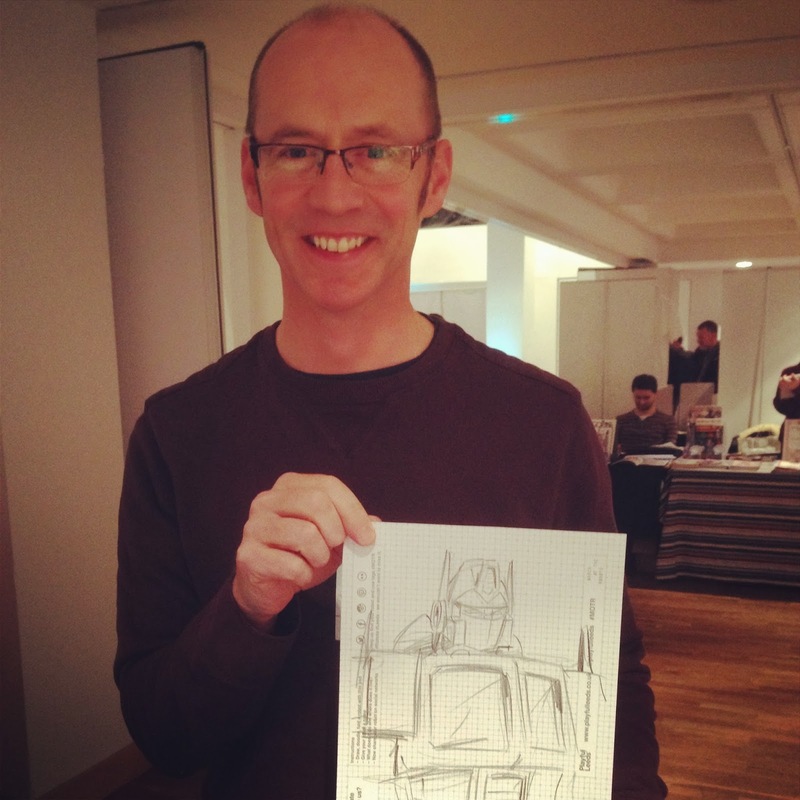 Why, it's legendary Transformers artist and Doctor Who storyboarder Andrew Wildman, with a special Celebrity Guest Robot! This kid was great, loved Platypuses so much he drew one brilliant Platypus-bot and then immediately drew another. ...and then a third. Which he proceeded to WEAR AS A MASK. 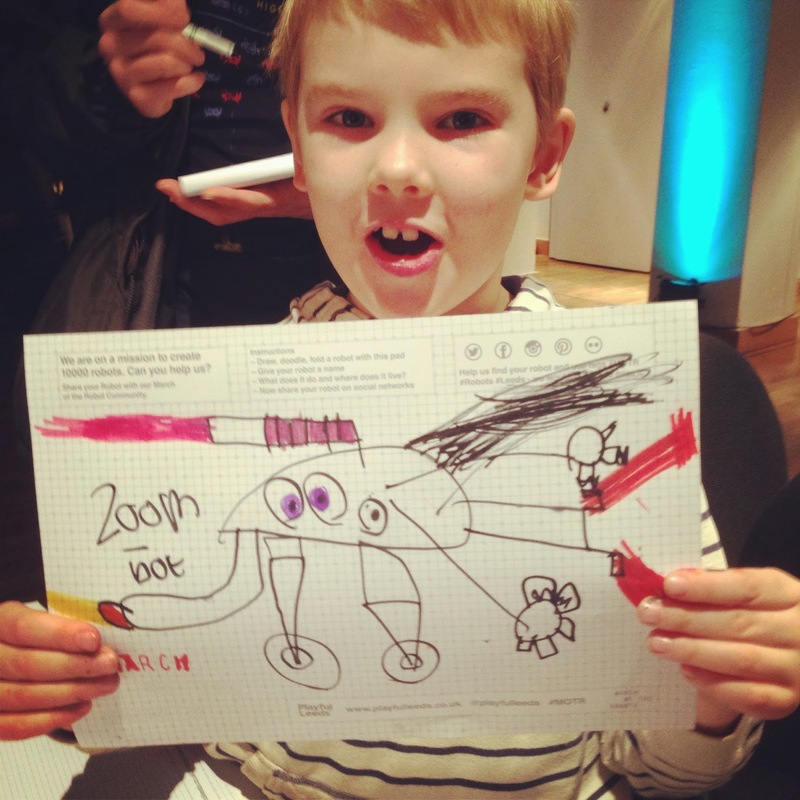 And finally, this young roboticist done FLIPPED THE SCRIPT on everyone, not merely drawing a robot but taking the drawing sheet and converting it INTO A ROBOT. Dammmmnnnnnn! Those are the few I managed to get pictures of, anyway, but they represent the merest grain of sand in the ENORMOUS BEACH of giant robot designs that had accumulated by the end of the weekend. The stated goal of the MOTR project is to design, construct or otherwise bring-into-being 10,000 robots in Leeds over the year, and I feel sure we must have made at least some steps towards that target at Thought Bubble. 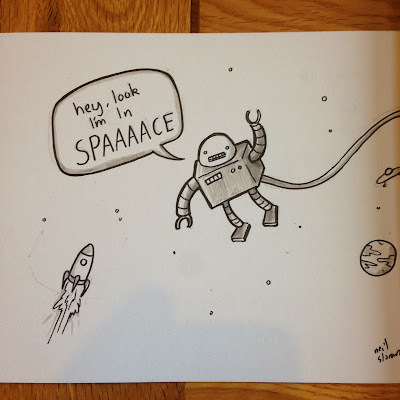 Oh hey, and here is a video of me, drawing a Pie Floater-Bot, for reasons I am not even going to attempt to explain. 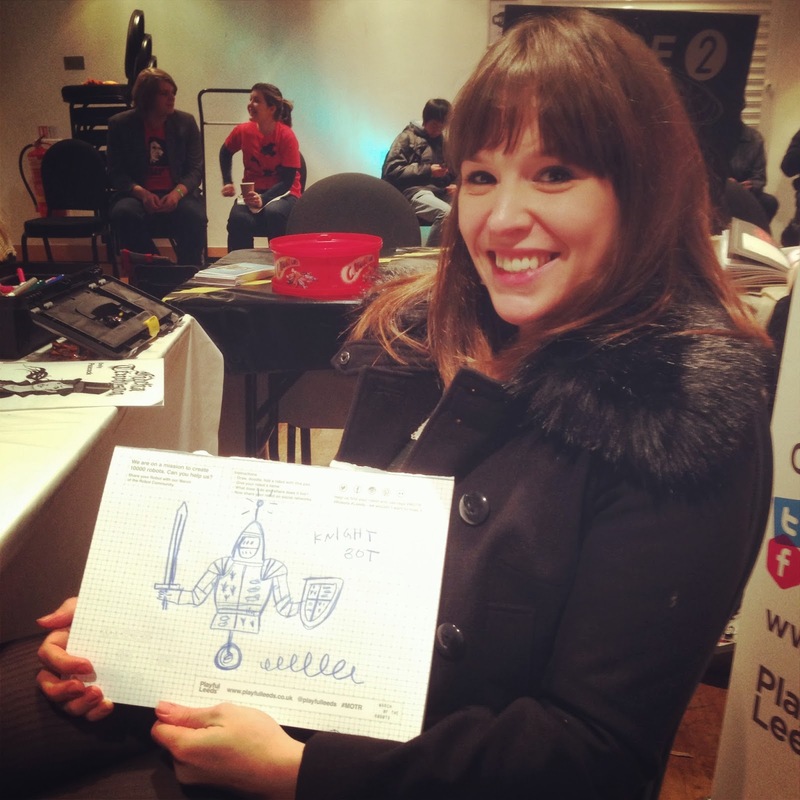 Anyway,it was a huge amount of fun, and I'd just like to say an enormous thank you to everyone who came along and hung out and drew robots, and most of all to Emma Bearman of Playful Leeds for inviting me along to be a part of it, and also for just being generally lovely, and also for buying me stew. 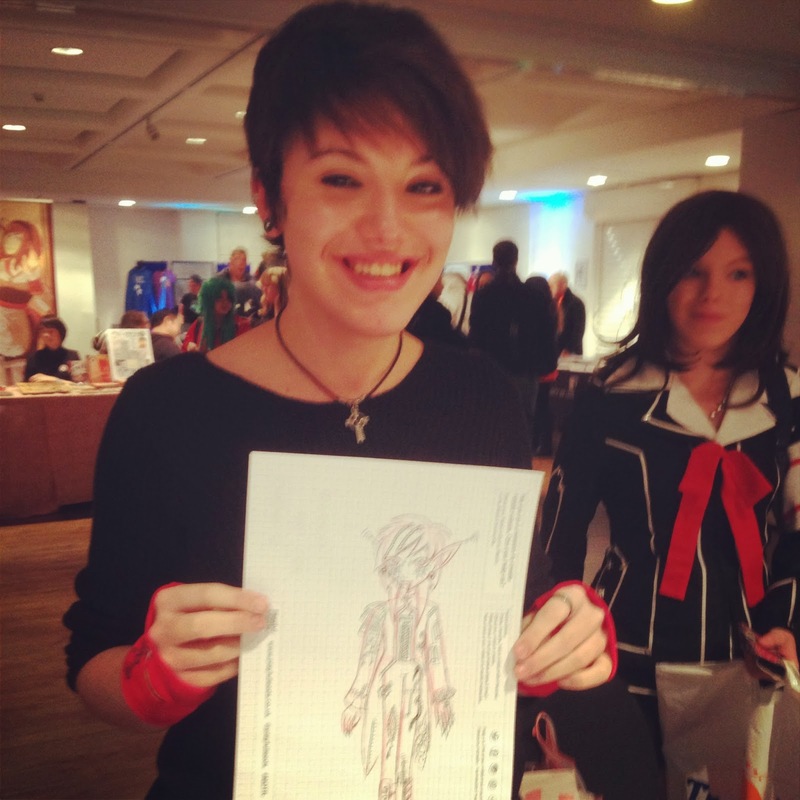 Anyway, that is One Cool Thing I was doing at Thought Bubble. Tomorrow, and indeed every day this week, I will try and post about some of the other ones.